The $100,000 Satin and Lace Stakes at Presque Isle Downs & Casino produced an impressive winner in Midwest invader Hotshot Anna, but it also gave third-place finisher Jessica Krupnick the title in the MATCH Series Filly and Mare Sprint–Dirt Division with one of five legs remaining. Jessica Krupnick, owned by Sycamore Racing V and trained by Francis “Tres” Abbott III at FairHill Training Center in Maryland, entered the Satin and Lace with 17 points based on a victory in the Dashing Beauty Stakes at Delaware Park and a second-place finish in the Regret Stakes at Monmouth Park. Her start at Presque Isle made her eligible for bonus money, and her third-place finish under jockey Trevor McCarthy after a bit of trouble in the stretch pushed her points total to 22. With only one division race left–the $100,000 Roamin Rachel Stakes at Parx Racing Sept. 15–only Liz's Cable Girl and Day by Day have a chance to qualify for bonus money should they start. But they can't accrue enough points to catch Jessica Krupnick, even with a victory. It's a long van ride from northeastern Maryland to northwestern Pennsylvania, but it paid off for Jessica Krupnick and her connections. “I was hoping we could put it away tonight,” said Abbott, who has embraced the MATCH series. Abbott said if all is well it is likely Jessica Krupnick would compete in the six-furlong Roamin Rachel. The 5-year-old mare is now tied with three other horses for second in the overall MATCH standings, and only one point behind the leader, Laki. Horses must start in at least three races in one division to qualify for bonus money. For the top horse by points, the owner receives $25,000 and the trainer $15,000. Bonuses also are paid for second and third in the division standings. 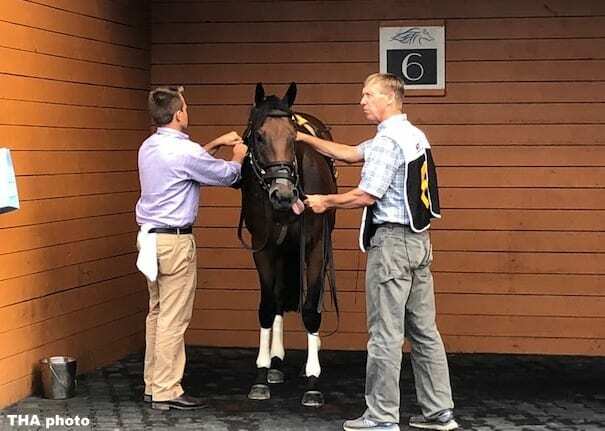 The Satin and Lace, at six furlongs on the Tapeta surface, is a local prep for the grade II Presque Isle Masters Stakes and as such lured several fillies and mares that regularly compete on synthetic surfaces at Arlington Park and Woodbine. Hotshot Anna, owned and trained by Hugh Robertson, had won the grade III Chicago Handicap at Arlington in sizzling time for seven furlongs in her previous start. The 4-year-old filly was well-placed just off the early lead under Antonio Gallardo but took command on the far turn and coasted home to win the Satin and Lace by 3 3/4 lengths in 1:08.86 on a track rated fast and paid $4.20 to win as the favorite. Crazy Sweet finished second, just a head of Jessica Krupnick. An objection filed by McCarthy against Erin Walker, who rode Crazy Sweet, for interference in the stretch was disallowed. The MATCH Series returns to Presque Isle Sept. 16 for the $200,000 Presque Isle Mile Stakes, final leg of the 3-Year-Olds and Up Long–Dirt Division. Next up on Aug. 25 is the $100,000 Sal DeBunda President's Cup at Parx, in which division leader Page McKenney (22 points) would compete in his fourth series event. 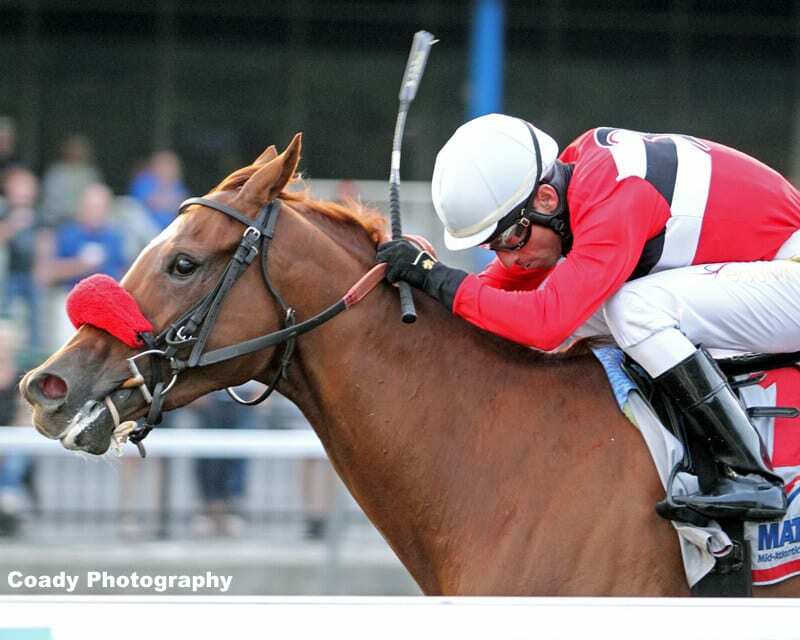 This entry was posted in Racing and tagged hotshot anna, jessica krupnick, match series, presque isle downs, satin and lace stakes by Press Release. Bookmark the permalink.